Clyde is a 5-year-old Walker coonhound. A big boy at 75 pounds, he has a really sweet disposition and loves to be with people. Clyde is neutered and would like to go home with someone soon. 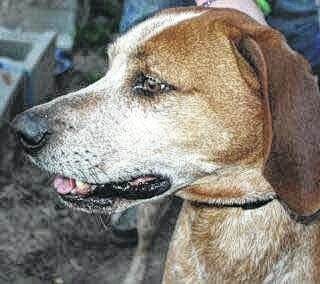 Meet Daisy, an 18-month-old red tick coonhound, measuring about 35 inches tall. A little shy, there is nothing a few days of TLC with a “forever family” won’t cure. She is spayed.